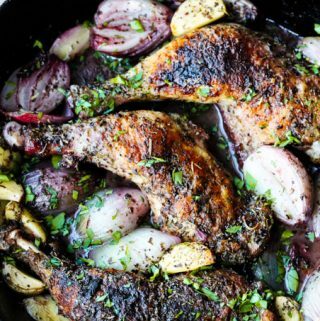 This Chicken Provencal with Shallots and Garlic is one of the best and easiest French chicken recipes you’ll find. 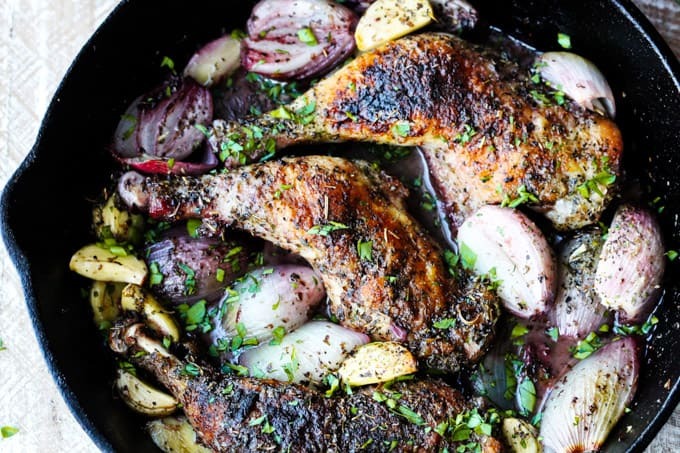 The chicken is first coated with flour, then seared to golden brown and finally pan roasted to perfection, with shallots, garlic, wine and plenty of Herbs de Provence. What makes this Chicken Provencal so special? First, it’s important to know that there are tones of different versions of Provencal Chicken that you can find on the web. But the common element that they all share is inclusion of tomatoes, olives and capers. 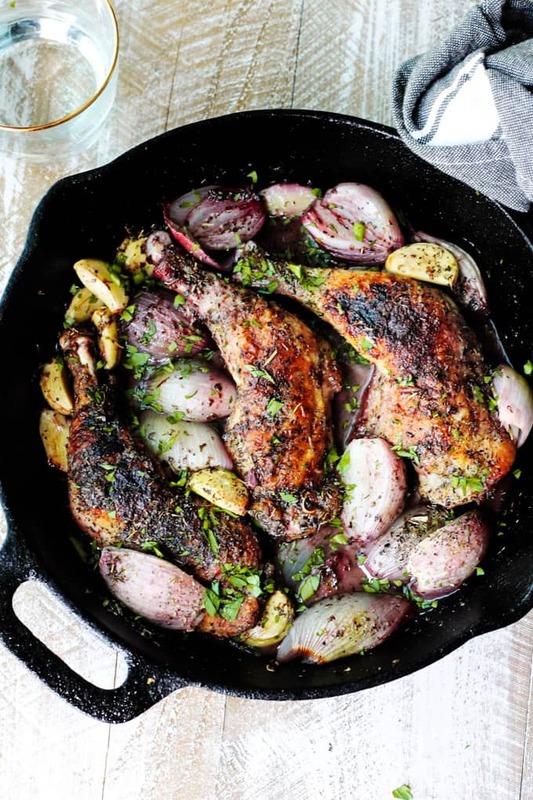 However, this pan roasted chicken Provencal differs from most in that it includes shallots and garlic. 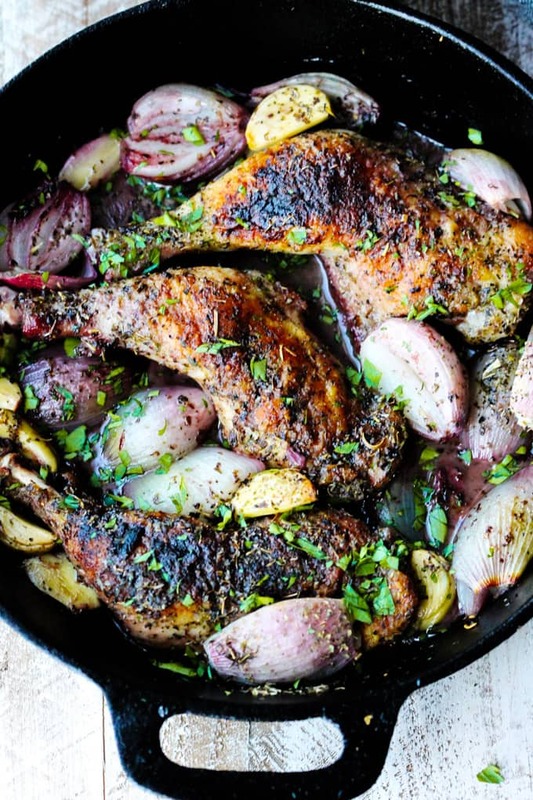 Originally this recipe for Roasted Chicken Provencal was inspired from the New York Times Cooking magazine. Now I don’t know if it was photos, or the actual recipe itself, but I do know that it found its way to my “To try” list shortly thereafter. Vaguely, I remember now that some of the ingredients were: chicken pieces, shallots, garlic, lemon, herbs de province and vermouth. Unfortunately when it came time to recreate, I wasn’t able to pull it back up, as I did not have a subscription to New York Times, (but that’s never stopped me). So, I decided to make it from memory and throw my little spin on it, and the result is absolutely outstanding. I don’t recommend chicken breast though, as they have tendency to dry out. While I am at it, I also don’t recommend boneless chicken thighs. 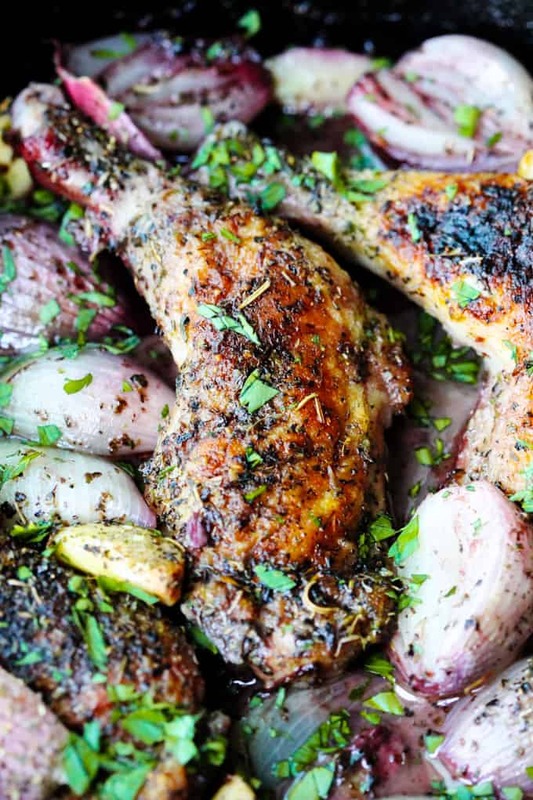 Bone-in chicken is way more flavorful and you’ll want all the juices in this pan. I used lemon juice and chose not use lemon pieces (which was part of the NYT recipe) for the final version of this recipe. Reason being is because I tested it few times and every time I added cut up lemons, my husband would constructively criticize that it was too “lemony”. (Gentlemen: I do not recommend employing constructive criticism in the kitchen until all parties are equally engaged in the culinary endeavor). Anyhow, I’ll admit it, the sauce had developed a bit bitter aftertaste with the lemon. So, instead I used just the lemon juice and it worked perfectly. In my trials of this recipe I used both red and white wine and both worked well. That said, use whichever one you have handy. Actually, the NYT recipe had Dry Vermouth instead of wine. But I’m a huge proponent of utilizing things that you have on hand. Nobody in my house drinks Vermouth, so I wasn’t going to buy a big bottle of alcohol that would go to waste. However, we love our wine! And lo and behold, wine works really well in this recipe. I use Wondra flour whenever I need some nice sear on my piece of meat or fish (I actually use it all the time). If you don’t know about magical properties of Wondra flour or never used it, then I encourage you to give it a try. It’s a very fine quick cooking flour, which is actually perfect for sauces. 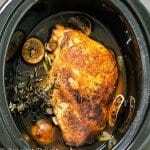 But ever since I made this Jacques Pepin Chicken with Garlic and Parsley I use it to coat most of my meats. If you don’t have Herbs de Provence on hand, you can add some of the spices listed above. However, the balance of this mixture is so perfect that I highly recommend and encourage you to pick up a bottle of it. You won’t regret it. These herbs just make everything taste better. 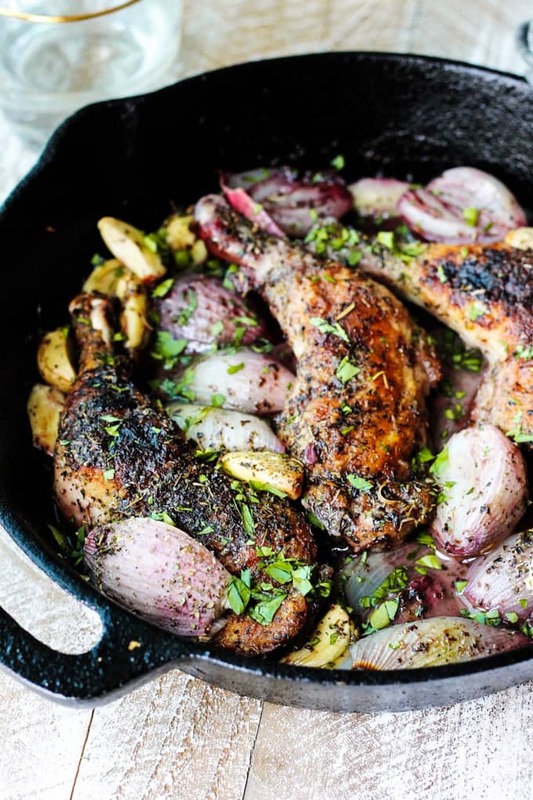 If you’re looking for Herbs the Provence recipe, this Chicken Provencal will definitely hit the spot. So, if you follow this blog, then you’re well aware that occasionally I share some anecdotes from my life. And when it comes to Herbs de Provence, we certainly have one. Here’s the thing, my husband doesn’t cook (though, he can do pretty good breakfast) and before I started this blog he was pretty oblivious when it came to culinary terms. But he is very witty and self-confident, so he can say something about a subject that he’s not familiar with, in such a manner that people are frequently fooled. Anyhow, my mother in law once told me that one Christmas, many moons ago, she wanted to make something special for everyone at a Christmas. So, as a fellow home chef, she decided to assemble her own medley of Herbs de Provence, and pack it into nice, rustic containers to hand out as gifts. Well, this was the first time my husband had heard the term and he immediately adopted it to signify all things culinary. Ever since, when he wanted to impress the uninitiated, he would sample a dish and when asked for a feedback, he would simply say that it could use “ a dash of Herbs de Provence”. Trust me, many people have walked away thinking that this guy knows his way around the kitchen; Admittedly, he got me with that one too, when we first started dating. Well, those who know him have now seen behind the curtain of the Great & Powerful Oz. With that said, I must admit, that his culinary knowledge expanded tremendously as he is now the chief editor/tester for this blog. Actually, it’s a bit odd for those of us who have known him to blow smoke in the kitchen, because he actually now has insights beyond Herbs de Provence Or perhaps, he’s just taken his trick to another level… the world may never know. Remove from the oven, place on a serving plate (affiliate link) and enjoy! What type of chicken I use? We are a participant in the ButcherBox (affiliate link), an affiliate advertising program designed to provide a means for us to earn fees by linking to ButcherBox (affiliate link). Now, I know we discussed the cut above, but as to type… I’m very much on an organic, health kick so I only buy organic, free ranch chicken for my family. If you’re like me, you may want to take a look at the ButcherBox that delivers the best quality meat straight to your door. ButcherBox chickens are certified humane, naturally fed and raised without antibiotics. That convinced me. If you are interested click on the banner below and receive 10% off and free bacon with your first order. You may already know it, but swear by my cast iron skillets. 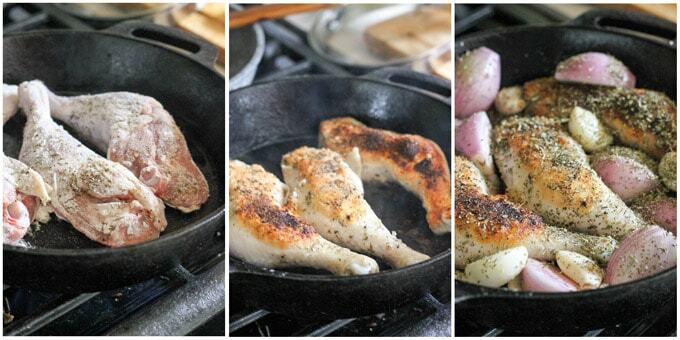 They distribute the heat evenly and that’s how you can achieve this perfect sear and color. And remember, color on the meat = flavor! Here’s where you can find the skillet that I use all the time ! 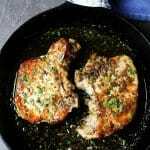 Put the flour in a shallow pan or plate and lightly coat your chicken in it; shake the chicken to remove excess flour. Remove from the oven, place on a serving plate and enjoy! 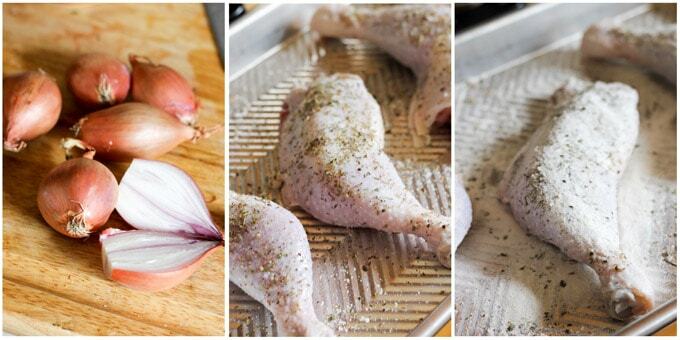 If you use 4 chicken legs, you can add one more shallot and two more garlic cloves but the rest of the ingredients can stay the same. 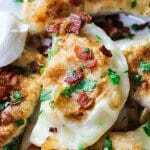 You can use chicken thighs or drumsticks instead. You can use about 6-7 pieces (depending on the size) for this recipe. If you want to brine your chicken, dissolve 3 tablespoons of salt in 3 cups of water and brine the chicken for 30 minutes. WOW! This just looks incredible! Your photos are beautiful and that fish looks so yummy!! I’m loving the color on that chicken – looks mouth watering! You can’t go wrong with French cooking!